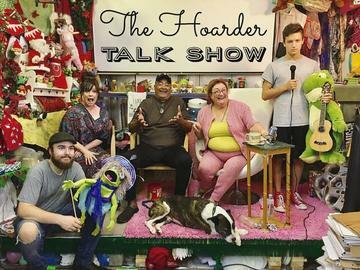 SHOW DESCRIPTION: Ms. Hoarder has heard that TV's auditioning for a new late, late night cable talk show host. So she’s decided to tape her giant mess, amazing guest stars, and a musical act, to send in to the network. Actress Myra McWethy brings her most colorful character to this world premier. ABOUT THE COMPANY: Myra McWethy is a character actress with credits including the off-Broadway smash hit, "Menopause, the Musical" (Earth Mother), and a range of theatre roles in New York, Chicago, Los Angeles, and San Diego. Treasured filmed roles include: fan-favorite appearances on Conan O'Brien's TBS talk show, "Malcolm in the Middle," "2 Broke Girls," & "iCarly," and her dirty dancing duet with Dylan McDermott in Funny or Die's hit video, "The Douche." Myra just received her master's degree in Critical and Creative Thinking from the University of Massachusetts. She's a writer, actor, producer, teacher, mom, wife, and happy human!